On this page you will find resources to help those affected by Hurricane Harvey. The U.S. Department of Education activated its emergency response contact centerTuesday. 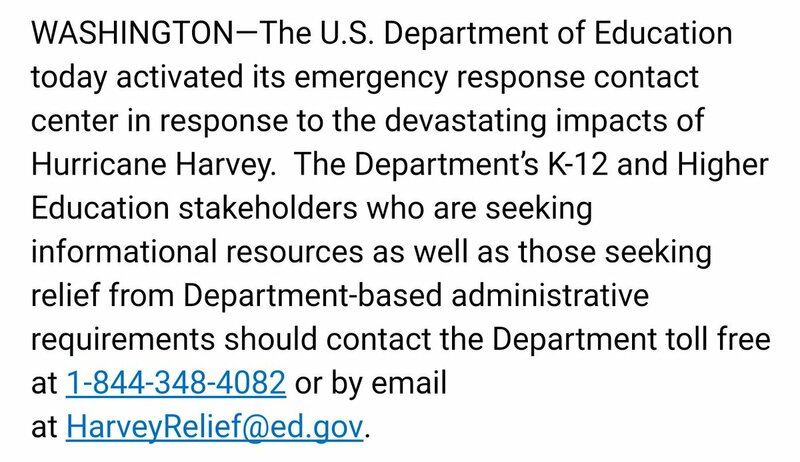 Education stakeholders seeking informational resources and relief from Department-based administrative requirements are encouraged to email HarveyRelief@ed.gov. Following reports that several Texans are missing in midst of the storm, the Red Cross is encouraging people to list themselves and their families as safe by clicking here. You can also receive disaster assistance from the Red Cross by calling 877-500-8645, or find a list of open shelters here. Call the United Way Helpline at 211 for information on shelters and other forms of assistance. The Texas Association of Business has established a hotline to provide resources to business owners affected by the storm. Call 512-637-7714 or see the website. Call the State Bar of Texas legal hotline at 800-504-7030 for toll-free answers to basic legal questions in English, Spanish or Vietnamese. If you need a lawyer, call the State Bar’s Lawyer Referral & Information Service at 800-252-9690. If you lost your job because of the hurricane, you may be eligible for unemployment benefits. Apply here. To report a missing child, call the National Center for Missing and Exploited Children at 1-866-908-9570. For those looking for refuge, Texas State Park camping is free to hurricane evacuees. Talk to a professional about emotional distress by calling the Disaster Distress Helpline at 1-800-985-5990 or texting “TalkWithUs” to 66746. Residents and business owners in counties who sustained disaster related damage due to Harvey can apply for assistance by registering online at www.DisasterAssistance.gov. Lost Dogs of Texas is maintaining several active Facebook pages documenting pets they’ve found amid the storm. Here is some information (with photos included) on animals found along the Coast Bend area and those in the Houston area. If your home was ravaged by the floods or sustained any storm damage, you can register your damage with FEMA at 1-800-621-3362. Check whether you’re eligible for disaster relief. Follow government guidelines on replacing important documents. RoweDocs is offering online healthcare services to Harvey victims. If you have a boat or a safe high-water vehicle, the Harris County Sheriff’s Office wants your help; the office put out a call on Twitter for residents to help with rescues. Call 713-881-3100 to help. The City of Port Arthur tweeted Wednesday morning that individuals with boats are needed to help with rescues. See a flooded street? Tell the Houston Chronicle. If you’re stranded and in need of assistance: One Texan created www.hurricaneharveyrescue.org, a website where those who require rescues can post their locations, and where those capable of conducting safe rescues can see a list of locations where they are needed. Portlight Strategies is working to help to help older adults and those with disabilities. Donate here. The Society for the Prevention of Cruelty to Animals of Texas is helping displaced animals. You can donate at www.spca.org/give or sign up to adopt a displaced animal at www.spca.org/foster. Austin Pets Alive, which transferred more than 200 pets to its shelter as of Saturday morning, is also seeking help, as are the Animal Defense League of Texasand the Houston Humane Society. If you see a stranded marine animal, call the National Oceanic and Atmospheric Administration’s Southeast Regional Office at 1-877-942-5343. Food banks are asking for nonperishable staples like canned meat and dry goods, as well as cleaning supplies; the Houston Food Bank, Southeast Texas Food Bankin Beaumont, Central Texas Food Bank, Galveston County Food Bank, Food Bank of the Golden Crescentand Corpus Christi Food Bank all accept online donations. See the Houston Press’s list of names and contact information for more food banks here. The Houston Food Bank announced Wednesday that is was open and ready to start distributing supplies to those affected by the flood. The food bank also emphasized the need for volunteers, who would be used to inspect and sort food and repack dry food, among other things. Donate food or cash to food banks in your area. Or you can donate to Feeding Texas, a network of food banks across the state. Find your local food bank here. You can also open your home to disaster victims through Airbnb. Make a cash or diaper donation to the Texas Diaper Bank, which is providing emergency diaper kits to displaced families. Donate cash or supplies for children with complex medical needs to Little Lobbyists. In East Texas, Athens First Presbyterian Church is accepting donations — including bottled water, nonperishable food, tarps, trash bags and clean up supplies — for hurricane relief efforts. The church is also looking for volunteers to help accept donations. Several local and national organizations are collecting donations for general disaster relief efforts, including the United Way, Americares, Salvation Army, Save the Children, Global Giving, Direct Relief, Heart to Heart and Southern Baptist Disaster Relief. Houston Texans defensive end J.J. Watt has set up a flood relief fund, backing the effort with his own $100,000 donation. Gofundme has curated a list of Harvey relief efforts, with fundraisers for individual cities, families and homes. Individuals and corporations can donate to hurricane relief efforts through the Voluntary Organizations Active in Disaster. The State of Texas Agriculture Relief fund (STAR fund) is collecting private dollars to help Texas farmers and ranchers recover from Hurricane Harvey. Help teachers in affected school districts rebuild their classrooms. You can help Hurricane Harvey victims by texting HARVEY to 90999 to give $10 to the Red Cross (or by visiting RedCross.org to give any other amount). The Hurricane Harvey Relief Fund, established by Houston Mayor Sylvester Turner, is accepting donations for flood victims. Several hospitals are reporting blood shortages and seeking donations in the wake of the storm. O negative and O positive donations are particularly helpful, but people of all blood types are encouraged to donate. Carter BloodCare is sending donations to Southeast Texas; see where you can donate here. You can also give blood through the South Texas Blood & Tissue Center; find out more on their website or by calling 210-731-5590. Driscoll Children’s Hospital in Corpus Christi — which never lost power — is accepting blood donations as well as financial support. Living outside of Texas? You can still donate blood through the Red Cross. Experts expect it’ll take some time before the floodwaters drain in Houston. In the meantime, several groups are seeking volunteers to help with recovery efforts. Volunteers can sign up for trips to the affected area through organizations like Samaritan’s Purse, Coastal Bend Disaster Recovery Group, Team Rubicon and Voluntary Organizations Active in Disaster. Volunteer Houston has launched a virtual Volunteer Reception Center to aid nonprofit agencies in flood relief efforts. More information here. If you’re in the Dallas-Fort Worth area, you can register to help at shelters through the Mass Care Task Force. Remote Area Medical is seeking medical personnel, as well as general support and supplies, to help with rescue efforts. Contact RAM at volunteers@ramusa.org or 865-579-1530. The Red Cross is seeking musicians to play at Austin-area evacuation shelters. The State Bar of Texas has a legal hotline to help people — specifically low-income Texans — with issues such as replacing lost documents and answering insurance questions. They also started a disaster relief volunteer form, which attorneys licensed in Texas can fill out here.